It’s always good to have a backup method in place. 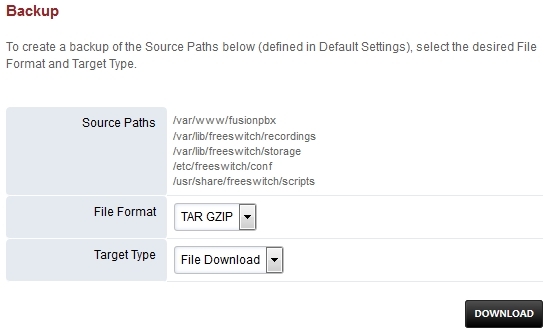 Here are the steps to a basic backup method with FusionPBX. Be sure to change the password by replacing the zzzzzzzz in PGPASSWORD=”zzzzzzzz” with your database password. You can get the password from /etc/fusionpbx/config.php. To save the file press ctrl + x then y to save it. Goto the last blank line and paste in the next line. press enter then save and exit. Once this is complete you will have the backup ready to execute by ./fusionpbx-backup.sh or from the daily cron job. Goto Advanced > Default Settings. Settings for FreeSWITCH package backup paths. Click "Reload" at the top of the page. Settings for FreeSWITCH source backup paths. From Advanced > Backup you can download the backup from the web interface this is optional. You would need to make sure that PHP doesn’t timeout while compressing your backup and that it has enough access to RAM to do the work.